Imagine this, you're just taking your little trike through the halls of an abandoned hotel and you run into two little girls who want to play. Not too scary, right? Umm, just kidding. These particular little girl twins have jumped from the classic horror movie scene from The Shining straight into our nightmares. How nice of them. Maybe they've made such an impact because they speak in unison. Maybe it's the flashes of gore that is shown to poor little Dannie. Or perhaps they're so creepy because of those out of place, old-fashioned dresses. Either way, these are some of the most powerful little girls we've ever seen! 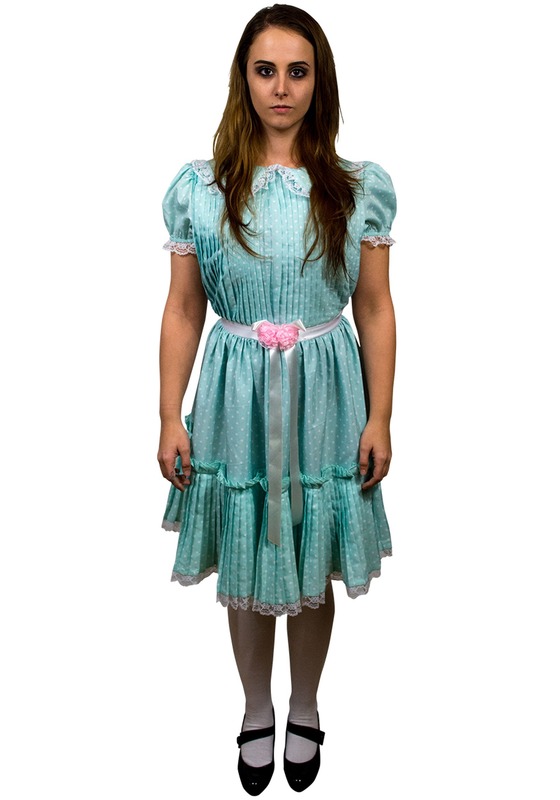 This dress is straight out of the epic scene from The Shining. The dress has a pleated front with a classic Peter Pan collar. The waist is belted with a white ribbon and centered with pink roses and a white bow. The skirt has deep pleats around the waist and around the hem. The hem is trimmed with white lace that matches the lace around the collar and sleeves. Whether you're a fan of the unforgettable Stephen King novel The Shining or you've been talking about Stanley Kubrick's movie since you first saw it, you'll love dressing up as one of the least forgettable characters from the epic tale. Don't forget to pair up with your twin. Want to take it a step further? Pair up with Jack Torrence to make the nightmare complete. Now, you might not have access to the Overlook Hotel but we're interested in seeing all the scares you stir up in this ensemble. Got some great photos of you and your cohort posing in a spooky hotel? Post them as a review and share the love you have for the Shining. And before you ask. No, we won't come play with you.